Tonight I was in the mood to make my Greek Style Spinach-Feta Pie -- I had all the ingredients to make it -- fresh organic baby spinach, fresh dill, lemon, feta cheese, eggs, etc. I love this dish because it reminds me of one of my favorite foods, spanikopita. It is both hearty and fresh tasting at the same time. You can make it using whole eggs or Egg Beaters, depending on your preference or what you have on hand. I used fresh dill tonight, but you could also use dried instead. I also prefer using fresh spinach but you could easily substitute frozen too if that is what you have available. My original recipe (linked above) calls for 3 cups of almond flour in the crust and it makes a nice thick sturdy crust. Tonight I wanted the crust to be a little bit thinner so I reduced the almond flour to only 2 cups and the butter down to 3 tablespoons instead (everything else remained the same). The dough covered my 10-inch Pyrex pie dish perfectly. I have re-copied the recipe below or you can simply click on the link above (with additional photos); and of course, I snapped a couple photos for you to see too. Enjoy! Preheat oven to 325 degrees F. Place all crust ingredients in a medium bowl. 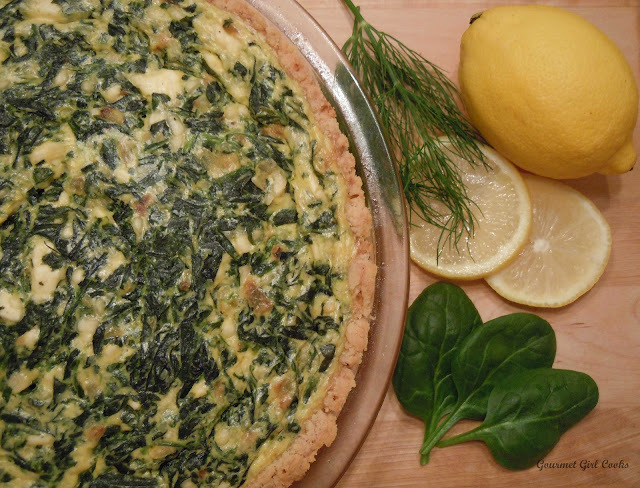 Cut butter and egg into flour with a pastry cutter until mixture resembles small pebbles and the flour is thoroughly moistened (the same way you prepare a pie crust). Press crust mixture into pie dish or tart pan (I used a 10" pyrex pie dish). Bake for approximately 15 minutes or until lightly browned; remove from oven and set aside. Increase oven temp to 350 F degrees. In a non-stick skillet, saute onions and garlic in olive oil until translucent; remove and set aside. In the same skillet, saute spinach just until wilted. Drain and press as much of the liquid out of the spinach as possible (I use a mesh strainer and press it with the back of a spoon). 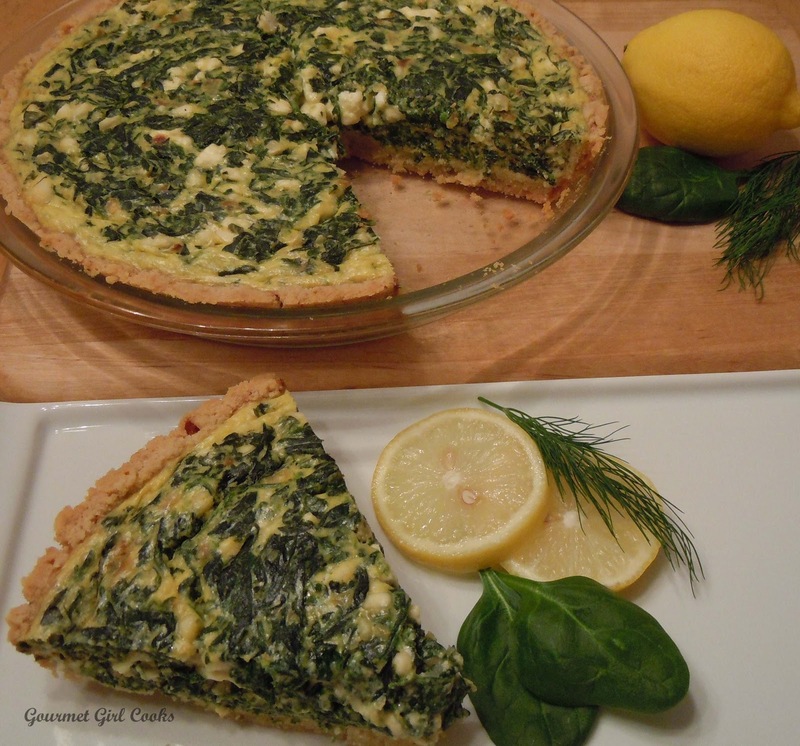 Place well drained spinach in a medium bowl; add cooked onions and garlic, feta, dill, lemon peel, pepper, eggs and half-n-half. Mix until well combined. Pour mixture into the lightly baked crust and bake at 350 F for 15 minutes; lower oven temp to 325 F (so edge of crust doesn't over brown); bake for an additional 15-20 minutes or until filling and eggs are set and cooked . If center still seems a little jiggly, cook an additional few minutes. Drooling! Will have to make this delicious looking recipe soon! Dear Gourmet Girl, I LOVE your blog and your recipes are so good. Please don't ever stop blogging or I will starve to death. What brand of almond flour do you use? How finely is it ground? That was a couple of months ago and almost immediately after my "disaster" I found out about Honeyville. I *finally* broke down and ordered a bag to try. It arrived yesterday. I was anxious to try it out, so just as soon as I unpacked the box I made “Basic Bread” from the new WB Cookbook. It is *so* worth it to get this flour for loaves. It turned out really well and it was completely baked in the time it was supposed to be! The new WB Cookbook has the only explanation I've found for why Bob's doesn't work well for loaves, cakes, etc. According to the book, it's because they don't press any of the oil out of the almonds before making the flour. Some other companies (and Honeyville must be one of them) do this to reduce the oil content of the flour. So, in my experience at least, Bob's is a nice product for some things, but unless you're baking something fairly small and flat, it just stays wet and won't cook through. I predict that your buttermilk biscuits will be even *more* delicious when I make them with Honeyville! I made this on Saturday and the family LOVED it. I made it following directions for the thinner crust which I thought was perfect. Thanks for posting another great recipe! Love the spinach pie! We had it for supper tonight. The crust is great! So glad I got the Honeyville almond flour. It has really been making a world of difference. I've been keeping the opened bag in the fridge. Is that how you store it, or should it go into the freezer? I'm guessing that the unopened bag will do OK at room temp. I love your recipes. Keep up the good work. Thank you for this. It look yummy. A question for you, so far I have used Honeyvile almond flour to make bread and pancakes. As per your recipe, I would blind bake the crust for this. I noticed that you don't mention using pie weights. Are they not necessary? Thanks again. 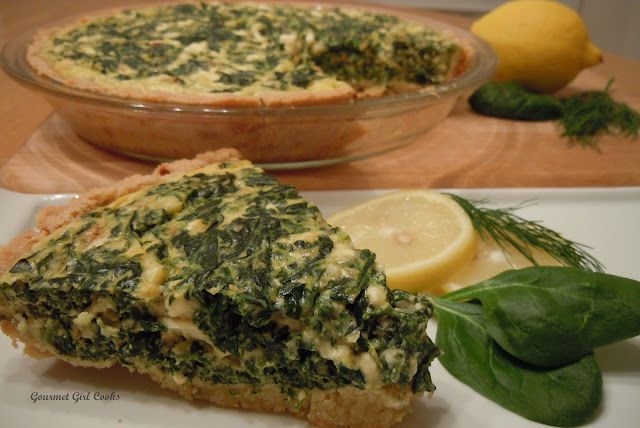 I am so eager to try this Spinach-Feta Pie! Thanks so much for sharing the recipe. I'd like to make your yummie sounding pie tonight. But in The Netherlands we do not know half and half for a dairy product (over here half and half refers to half white wine and half champagne,lol) Would I mix half milk and half (whipping) cream? I also decided to try an experiment ... rolling the dough between two sheets of waxed paper, instead of pressing it into the pie plate. This worked *very* well, and turned out to be much easier for me. (I used the thinner crust recipe.) I didn't think to prick the dough before the initial baking, and the bottom of the dough really lifted up from the bottom of the pie plate. It looked like it might just float away! :-) But after removing it from the oven it started to deflate and I was able to gently pat it back into place with no damage to the crust. I suppose it might have been a different story if the *sides* had lifted up, as well! Another little "experiment" was out of necessity. I discovered that I had only about 3/8 of a cup of half-and-half. I brought the volume up with plain water and it worked just fine! Hi CyberSis! Good idea making the crust in the food processor. That would be especially helpful for some of those that might have wrist or hand issues (I remember Barbara telling me she had arthritis that impacted her hands -- speaking of which I haven't heard from her recently and hope she is okay). Great to know it rolls out well, too. Did you chill it before transferring to your baking dish or was it difficult moving over? I know with my chicken pot pie, chilling that dough made all the difference in the world moving it over to my casserole dish.